Since 1276 Austria ruled over many people and countries, and in the nineteenth-century one of these lands was the Hungarian kingdom which included the Slovak people. Austria maintained its traditional leadership until it was drawn into the "Seven Weeks' War of 1866." After Austria was defeated, Hungary was in a position to barter for more power, and the Ausgleich, or Compromise, of 1867 gave Hungary legal equality with Austria. Austria-Hungary was a land of many different peoples. Each nationality group had its own part of the country and was almost a separate unit. Twelve million Germans and ten million Magyars dominated twenty-three million Slavs, three million Rumanians, and many smaller groups. The weaker groups were devoted to their own customs and languages. People were loyal to a nationality group, rather than to Austria-Hungary. World War I, which changed the map of Europe, completely destroyed the Dual Monarchy. 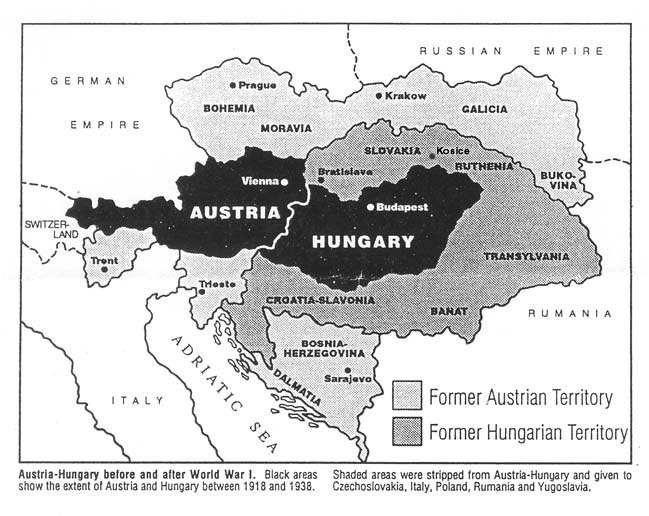 The land area of Austria-Hungary, including that of Bosnia-Herzegovina, was 261,241 square miles. It was slightly smaller than Texas. Czechoslovakia was created after World War I by putting together several parts of the old Austro-Hungarian Empire. Bohemia (Cechy) and Moravia make up the western, Czech part of the country. The Slovaks live in the eastern half, which is called Slovakia. The land area of Czechoslovakia was 49,355 square miles. Greatest length is about 600 miles, greatest width is about 185 miles. It is a little larger than the state of Louisiana. After World War II, Czechoslovakia became a vassal state of the Soviet Union. In January of 1993 Czechoslovakia became two countries - the Czech Republic and the Slovak Republic.